theology, mythology, peace and equality. The Logo represents your SPIRIT. When you wear it, you will feel empowered by a sense of pride and confidence. Rendered by the artist with a Chinese calligraphy brush, it is a hand painted, abstract representation of the soul, the spirit, and the angel within you. Despite turbulent times, it is our Eternal Faith that slices through the darkness and keeps our hearts pure. Our spirits endure and we rest our minds peacefully, fully aware that supreme forces exist beyond our control. Mankind is bound together by this common thread. We all share the same creator and are all children of beautiful Mother earth. We are all brothers, sisters, fathers, mothers, uncles, cousins, aunts, grand parents, lovers, and friends. 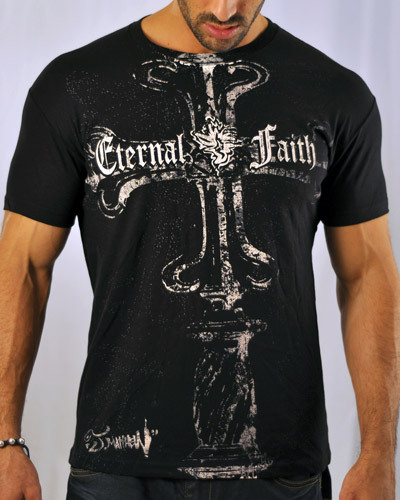 With this in mind, we chose to name our clothing line ” Eternal Faith “. While many other brands are promoting images of doom and gloom, we deemed it necessary to breathe a sigh of optimism into the world of fashion. Our commitment to original artwork and using only the finest quality materials easily distinguishes our brand in a world that can sometimes seem filled with the ordinary. We have developed many new techniques that allow the artist to express his visions and transform each piece into a walking canvas. Every item in the collection is akin to a mixed media master piece. No two are a like and we also offer limited editions that come with signed prints. 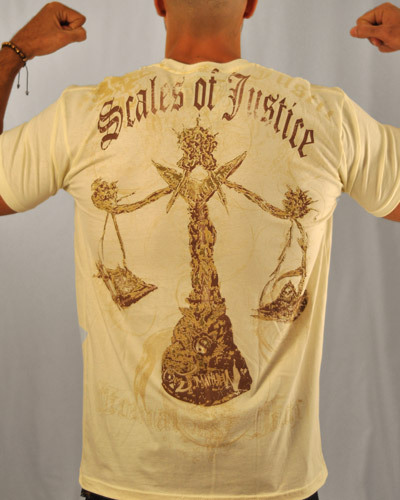 Prints and Gicles are of the original art that each shirt was derived from and ispired by. A story from the artist will be included with each piece explaning the concepts behind the design. There will also be a certificate of authenticity. 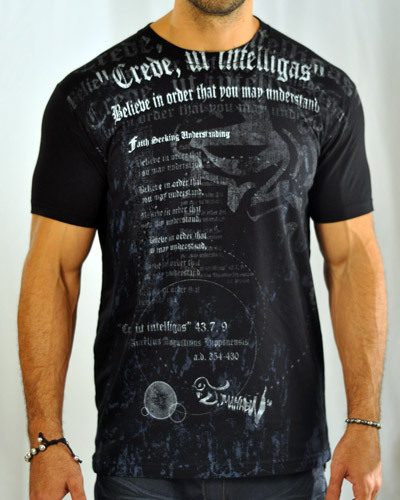 The majority of our T Shirts are fashion fitted, 100% soft Ringspun cotton. They are Designed, printed and embellished in the United States of America.